Our range of products include triple effect evaporator, rotary evaporator and falling film evaporators. Triple Effect Evaporators are manufactured as a complete system including feed tanks, feeding pumps, heat exchangers, condensed withdrawal pumps & Barometric legs with steam ejectors. The systems are designed in any material of construction & capacity to suit the requirement. 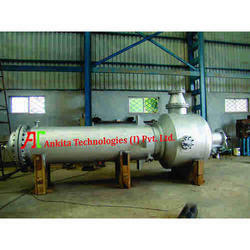 The highly advanced state-of-the-art infrastructural facility at Ankita Technologies (India) Private ltd., has been equipped with all the machinery and equipment needed to manufacture Rotary Evaporator, which facilitates the attainment of several of the firm’s predefined goals and targets. In order to manage the firm’s operations efficiently and effectively, the facility has been parted into several highly operational units. The facility, for maximizing productivity and reach in the market, is upgraded on a highly regular basis. Further, our highly ethical work practices have helped us generate a huge client base. 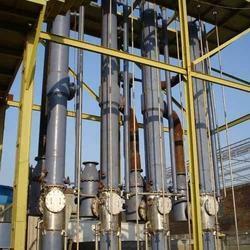 We have a quality Falling Film Evaporators surrounded by steam jackets, which are superlatively used for enhancing the concentration of the solution. These evaporators are developed by making use of optimum grade raw materials to give exceptional evaporation by consistently distributing the solution uniformly. This special heat exchanger primarily adapts continuous evaporation and concentration at low operational temperature. With its optimum heat transfer efficiency, the evaporator superiorly minimizes the material heating time. Plot No. P. A. P. R/24, Rabale, M. I. D. C.